If you want to boost energy levels while detoxing simultaneously, look no further than the beetroot. Below are just 6 beets health benefits, though know that this root vegetable has much more to offer. 1. Beets are widely known to help create red blood cells – The red pigment color of beets is from a group of phyotonutrients known as betalains. Betalains are antioxidant, anti-inflammatory, and detoxifying agents that are richer in beets than other plant foods. 2. Anti-Inflammatory – The anti-inflammatory aspect of betalains helps prevent many chronic diseases and promotes cardiovascular health. Early research indicates the betalains support nerve and eye tissue better than most other antioxidants. 3. Anti-Cancer – Among other health benefits of beetroot, beet betalains provide some cancer prevention capacity, especially against colon cancer. In vitro (test tube or petri dish) lab tests have reported beet betalain suppression of human cancer cells. It has been observed that betalains provide a more varied and higher antioxidant value than most other vegetables containing beta-carotene. 4. Rich in Vitamin C, Folate, Other Nutrients – In addition to the high betalain phytonutrient content, beets are very high in vitamin C, folate (a natural source of folic acid), manganese, magnesium, and potassium. These vitamins help bolster the immune system and support a healthy pregnancy for women, among other things. The fiber in beets is similar to carrots and supports gastrointestinal health as well. 5. Detox – When it comes to detoxing, certain enzymes in beet betalains stimulate glutathione production and connect toxins to glutathione molecules. Then the toxins are neutralized and excreted harmlessly. 6. Improves Digestion – A high fiber count makes beets a prime choice for those with digestive issues. Fiber helps to promote digestive and colon health by cleaning out the gastrointestinal system and making for regular, healthy bowel movements. Digestive markers: Beeturia, pink or red urine occurs sometimes after consuming beets, beet soup, or beet juice. Beeturia could be an indicator of a low iron absorption at worst. 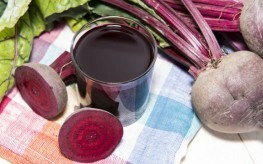 A more likely occurrence is pink or red water surrounding one’s stool after consuming beet preperations. Dr. John Douillard, DC, who also specializes in Ayurvedic medicine, recommends using the red stool from beets as a marker for your digestive cycle. If it appears in less than 12 hours after consuming beets, it’s likely your digestive cycle is too short and you’re not absorbing enough nutrients. Here are 4 other health benefits of beets. Rule number one is to buy organic beets whenever possible. When you’re ready to use the beets, peel the outer skin with a good peeler and slice or dice appropriately for your food or juice application. Cooking beets for 15 minutes removes most of beets’ nutritional value. So juicing beets with other vegetables and consuming beets raw are better choices for beets. With a good slow speed masticating juicer, I use the least expensive Omega juicer, you can add carrots, celery, apple, ginger root, and some lemon along with one beet sliced. In addition to juicing, you can thinly slice or shred them for a raw topping on salads, which is actually pretty tasty. Buying organic beets with the attached plant greens gives you an added nutritious vegetable to steam or juice. Beet greens are a bit like chard, but the detached beet roots cost a little less. You can also make a traditional fermented Beet Kvass to have on hand for small beverage digestive aids and protection against infection. Here’s the recipe. Don’t wait! Start experiencing beets health benefits today. Thank you. I’m going to try putting organic beets and greens into my Nutribullet along with some other veggies…. I love beets and it’s one I look to buy only Organic.